Great Value! Combo pack includes Blu-ray™ 3D, 2 Blu-ray™ Discs, DVD and a Digital Copy of the Movie! Great Value! Combo pack includes Blu-ray™ Disc and DVD of the Movie! Race against the world's top racers! Find your favorite Cars characters in this poster! 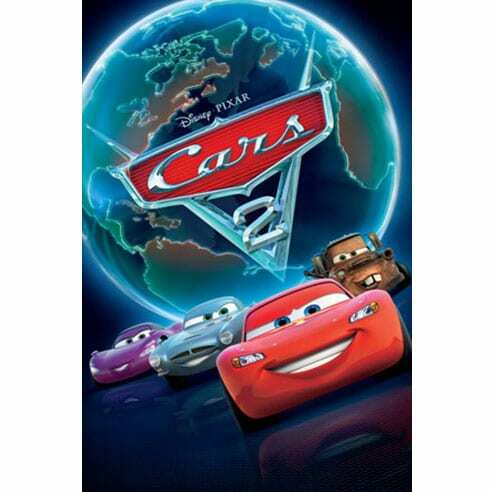 Star race car Lightning McQueen and the incomparable tow truck Mater take their friendship on the road from Radiator Springs to exciting new places when they head overseas to compete in the first-ever World Grand Prix to determine the world's fastest car. But the road to the championship is filled with plenty of potholes, detours and hilarious surprises when Mater gets caught up in an intriguing adventure of his own: international espionage!